The books is ten inches tall, seven inches wide, and one inch thick. It contains 370 pages, many of them illustrated, several blank, and five that are completely black. There are at least four fonts (and more languages than that, although the book is primarily in English). Have I lingered over form too long here? It’s difficult to describe the content of Shattering the Muses (which often foregrounds the “narrative’s” form). (Some historians remark that Quin Shi Huang caused to be buried alive 460 Confucian scholars). 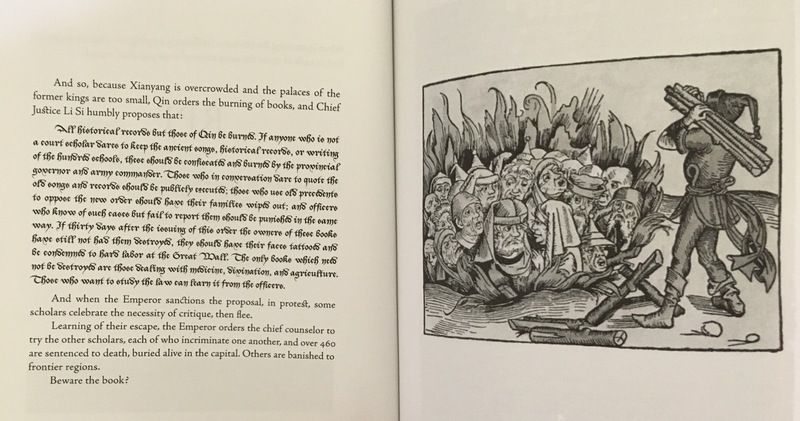 On the opposing/facing page, a 1493 German woodcut depicts Jews being buried and burned alive, scapegoats for the Black Death plague. The woodcut provides an answer to the question: “Beware the book?”: No, beware the burners. The space between the two pages is a gap for the reader to cross. Put the pieces together. The next page reproduces Johan Liss’s painting Apollo and Marsyas (c. 1627). The satyr Marsyas found and mastered the first aulos, an double-reed wind instrument cast away by Athena. (She didn’t like the shape her invention brought to her virgin cheeks). Marsyas challenged Apollo to an aulos contest and lost, natch. (Apollo’s daughters the Muses were the judges). Marsyas was subsequently flayed alive, his hide nailed to a tree. Victim for art’s sake. 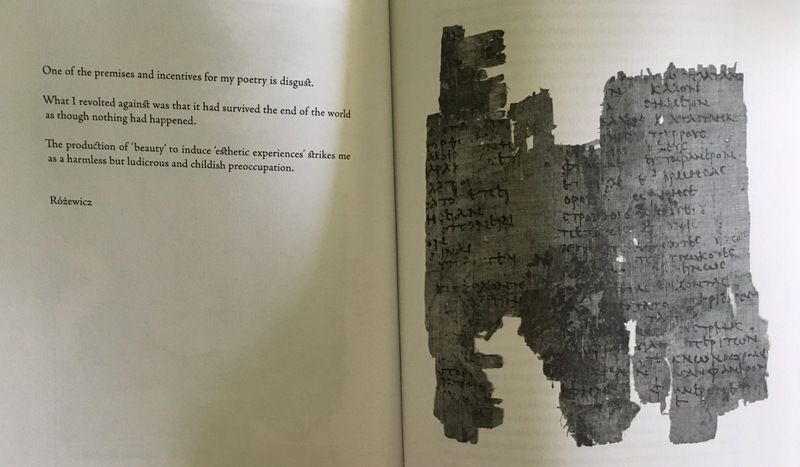 (The first page of Shattering the Muses is a quote from Ovid’s Fasti. The lines describe Athena discarding her aulos: “Art is not worth this to me,” she says, seeing her reflected face deformed in the river as she produces the “sublime” music). One more set of two pages, then. (It’s easier to show the book than to properly describe it in words. This is not a review). Above: Tadeusz Różewicz was a Polish poet who fought in the resistance movement against the Nazi occupation. He survived the war. His brother Janusz, also a poet, did not. He was executed by the Gestapo in 1944. However, Shattering the Muses is not entirely composed of loosely arranged but discontinuous fragments. Several narratives strand through the book. The most straightforward of these is the story of Renato Naso, who is the closest thing to a main character we’ll find here. When we’re introduced to him, we’re told that he’s “unknowingly putting his life in suspension…living in an eternal between.” He’s a hero (?) ripe for “rupture, fracture, and shattering.” (Perhaps if we take Shattering the Muses as a “novel” we could imagine that the events within take place in Naso’s stretched consciousness—a more secure place for such horrors than, uh, historical reality). When we first meet him, he’s leaving New York for Berlin, forced to abandon most of his books and store them in his brother’s garage. His brother’s house and garage are flooded by Hurricane Sandy, but his library miraculously survives. And yet the historical accounts of book burnings (and human burnings) cataloged in Shattering the Music attest that no library is ever safe. As Milton suggests, libricide and homicide are intertwined. Hence, other background “characters” emerge more prominently than others in Shattering the Muses: Hitler, Mussolini, the Gestapo. The specter of the Nazis and the Holocaust weigh heavily here, heavier than the (many) other libriciders documented. Against this evil Hanshe gives us a resistance—a wonderful chapter lingers on Samuel Beckett, who’s escaped Occupied Paris to hide in the small village of Roussillon. There, “separated from his library…literary freedom erupts” for Beckett. Absence is a generative power. Other figures resist through art, even if they perish in the horror, like Hungarian poet Miklós Radnóti, murdered by the Nazis near Győr and tossed into a mass grave. 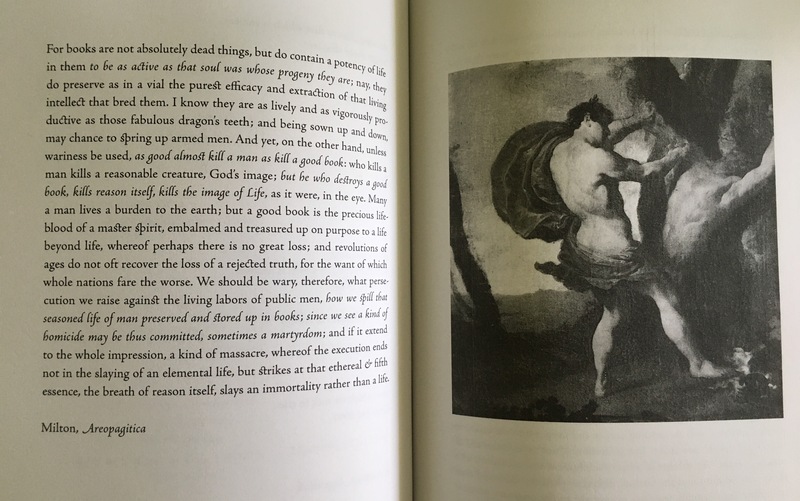 In a poetic turn, Hanshe notes “it is a daring Marsyas that he becomes, risking his flesh doubly before a merciless & savage Apollo, for he will not cast his aulos to the turf of the riverbank.” Deft touches like these link this “novel’s” motifs of beauty and destruction, art and murder. A narrative forms too from more oblique strategies—a plague of mutating billboards, for instance, or spiderwebs of poetry. Handbills, demands, stray bits of philosophy. But maybe I’m back where I started—go all the way back to the title here: This is not a review of Shattering the Muses. I can’t properly parse it, really. It’s overwhelming—linguistically, philosophically, typographically, aesthetically. Intellectually is a word to use here. Hell. It’s a lot to digest all at once. Let me admit that I’m more interested in picking at it slowly. Hanshe’s put a lot of material on the table. It’s a rich meal. Who is Shattering the Muses for? I hope that I’ve shared enough snippets to give you a sense of what (might be) happening here. I enjoyed it, and enjoy it more in the sense of a text to return to. At the same time, this book is clearly Not For Everyone. Shattering the Muses is an encyclopedic poem, a Choose Your Own Adventure story of aesthetic horror and loss. It’s not likely to cohere for you quickly and neatly, but it’s a weird joy to think (and feel) through. From Anathemas and Admirations. Translated by Richard Howard. Every happiness that a man enjoys, and almost every friendship that he cherishes, rest upon illusion; for, as a rule, with increase of knowledge they are bound to vanish. Nevertheless, here as elsewhere, a man should courageously pursue truth, and never weary of striving to settle accounts with himself and the world. No matter what happens to the right or to the left of him,—be it a chimaera or fancy that makes him happy, let him take heart and go on, with no fear of the desert which widens to his view. Of one thing only must he be quite certain: that under no circumstances will he discover any lack of worth in himself when the veil is raised; the sight of it would be the Gorgon that would kill him. Therefore, if he wants to remain undeceived, let him in his inmost being feel his own worth. For to feel the lack of it is not merely the greatest, but also the only true affliction; all other sufferings of the mind may not only be healed, but may be immediately relieved, by the secure consciousness of worth. The man who is assured of it can sit down quietly under sufferings that would otherwise bring him to despair; and though he has no pleasures, no joys and no friends, he can rest in and on himself; so powerful is the comfort to be derived from a vivid consciousness of this advantage; a comfort to be preferred to every other earthly blessing. Contrarily, nothing in the world can relieve a man who knows his own worthlessness; all that he can do is to conceal it by deceiving people or deafening them with his noise; but neither expedient will serve him very long. From Arthur Schopenhauer’s The Art of Controversy. Translated by T. Bailey Saunders. The brain may be regarded as a kind of parasite of the organism, a pensioner, as it were, who dwells with the body: and leisure, that is, the time one has for the free enjoyment of one’s consciousness or individuality, is the fruit or produce of the rest of existence, which is in general only labor and effort. But what does most people’s leisure yield?—boredom and dullness; except, of course, when it is occupied with sensual pleasure or folly. How little such leisure is worth may be seen in the way in which it is spent: and, as Ariosto observes, how miserable are the idle hours of ignorant men!—ozio lungo d’uomini ignoranti. Ordinary people think merely how they shall spend their time; a man of any talent tries to use it. The reason why people of limited intellect are apt to be bored is that their intellect is absolutely nothing more than the means by which the motive power of the will is put into force: and whenever there is nothing particular to set the will in motion, it rests, and their intellect takes a holiday, because, equally with the will, it requires something external to bring it into play. The result is an awful stagnation of whatever power a man has—in a word, boredom. To counteract this miserable feeling, men run to trivialities which please for the moment they are taken up, hoping thus to engage the will in order to rouse it to action, and so set the intellect in motion; for it is the latter which has to give effect to these motives of the will. Compared with real and natural motives, these are but as paper money to coin; for their value is only arbitrary—card games and the like, which have been invented for this very purpose. And if there is nothing else to be done, a man will twirl his thumbs or beat the devil’s tattoo; or a cigar may be a welcome substitute for exercising his brains. From The Wisdom of Life by Arthur Schopenhauer (translation by T. Bailey Saunders). When you find human society disagreeable and feel yourself justified in flying to solitude, you can be so constituted as to be unable to bear the depression of it for any length of time, which will probably be the case if you are young. Let me advise you, then, to form the habit of taking some of your solitude with you into society, to learn to be to some extent alone even though you are in company; not to say at once what you think, and, on the other hand, not to attach too precise a meaning to what others say; rather, not to expect much of them, either morally or intellectually, and to strengthen yourself in the feeling of indifference to their opinion, which is the surest way of always practicing a praiseworthy toleration. If you do that, you will not live so much with other people, though you may appear to move amongst them: your relation to them will be of a purely objective character. This precaution will keep you from too close contact with society, and therefore secure you against being contaminated or even outraged by it. Society is in this respect like a fire—the wise man warming himself at a proper distance from it; not coming too close, like the fool, who, on getting scorched, runs away and shivers in solitude, loud in his complaint that the fire burns. From Counsels and Maxims by Arthur Schopenhauer (translation by T. Bailey Saunders). Nor is it otherwise with human life, only that here the entrance is not of our choosing, but is forced on us; and the object, which is to live and exist, seems, indeed, at times as though it were of arbitrary adoption, and that we could, if necessary, relinquish it. Nevertheless it is, in the strict sense of the word, a natural object; that is to say, we cannot relinquish it without giving up existence itself. If we regard our existence as the work of some arbitrary power outside us, we must, indeed, admire the cunning by which that creative mind has succeeded in making us place so much value on an object which is only momentary and must of necessity be laid aside very soon, and which we see, moreover, on reflection, to be altogether vanity—in making, I say, this object so dear to us that we eagerly exert all our strength in working at it; although we knew that as soon as the game is over, the object will exist for us no longer, and that, on the whole, we cannot say what it is that makes it so attractive. Nay, it seems to be an object as arbitrarily adopted as that of checkmating our opponent’s king; and, nevertheless, we are always intent on the means of attaining it, and think and brood over nothing else. It is clear that the reason of it is that our intellect is only capable of looking outside, and has no power at all of looking within; and, since this is so, we have come to the conclusion that we must make the best of it. Truly it is the world itself that is a miracle; the world of material bodies. I looked at two of them. Both were heavy, symmetrical, and beautiful. One was a jasper vase with golden rim and golden handles; the other was an organism, an animal, a man. When I had sufficiently admired their exterior, I asked my attendant genius to allow me to examine the inside of them; and I did so. In the vase I found nothing but the force of gravity and a certain obscure desire, which took the form of chemical affinity. But when I entered into the other—how shall I express my astonishment at what I saw? It is more incredible than all the fairy tales and fables that were ever conceived. Nevertheless, I shall try to describe it, even at the risk of finding no credence for my tale.